The life system is a "trans-omic" network, consisting of interactions between numerous molecules across multi-omic layers, such as genome, transcriptome, proteome, and metabolome. Lifestyle diseases can be regarded as complex multifactorial diseases caused by breakdowns in a trans-omic network rather than breakdown of a single molecule. Due to recent advances in measurement and analysis methods for single-omic layers, trans-omic analyses integrating multi-omic data are in state-of-the-art development. 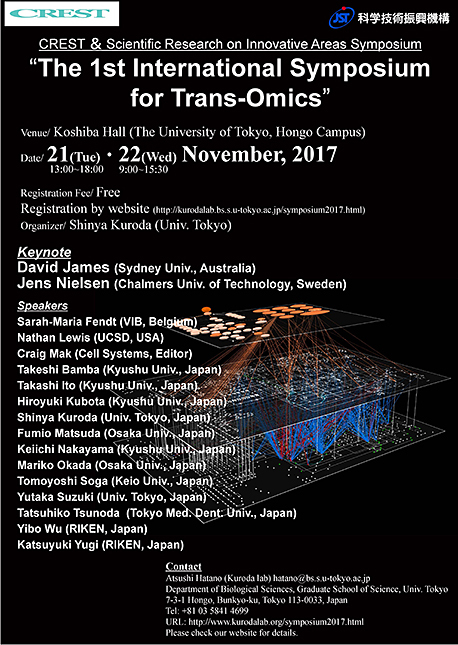 Here we hold this symposium to shed light on strategies and obstacles in integrating multiple omic layers to establish trans-omic approaches, and to have a discussion with cutting edge researchers in omics research fields. Furthermore, we propose "whole human body trans-omics", integrating trans-omic analyses for whole human organs, as an international milestone for rapid expansion of trans-omic approaches.